The book Someday by Alison McGhee has got to be one of my favorite children's books of all times. I believe it tells a timeless tale that can affect all ages. It tells a tale of a mother and daughter growing older and the daughter eventually leaving home, yet her mother never really leaves her side. It really captures a mother and daughters relationship perfectly. 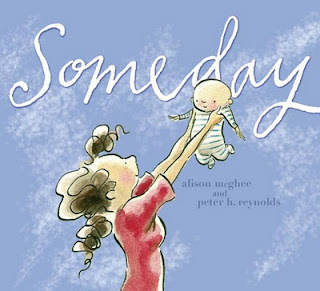 The illustrations by Peter H. Reynolds are amazing and really bring the words to life. He uses simple colors and drawings that fit the book perfectly without distracting from the words. He has quickly become one of my favorite illustrators, I will buy a book just because he illustrates it. Simple put, If you don't have this book already you should probably go out and by it...Now!